On our way out of Littlehampton and into Climping, we passed a loopholed wall. It was some kind of fortification. What was this, or what did it used to be? Certainly Littlhampton has its own fort, the Littlehampton Redoubt, built in 1854, to protect the mouth of the River Arun from French attack during the Napoleonic Wars, but that lay back east. This was something different. 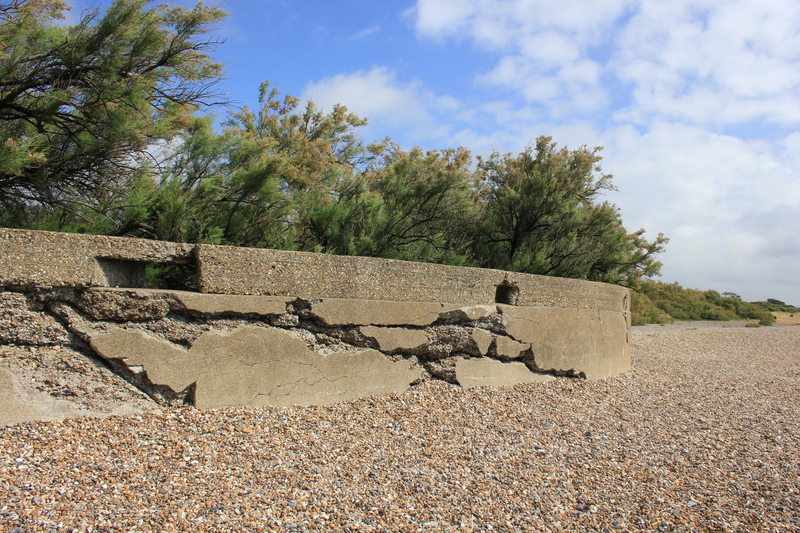 It was made of reinforced concrete; a World War II fortification perhaps? Whatever this was, we only spent a short while thinking about it. My eyes were drawn to other things. My favourite colour is green, and green was out in force today! It doesn’t take much green to make all the difference to a landscape, especially when there is a clear blue sky to accentuate it. When we reached Elmer, Mother Nature showed us that if Man provides the canvas, she’ll provide the paint! 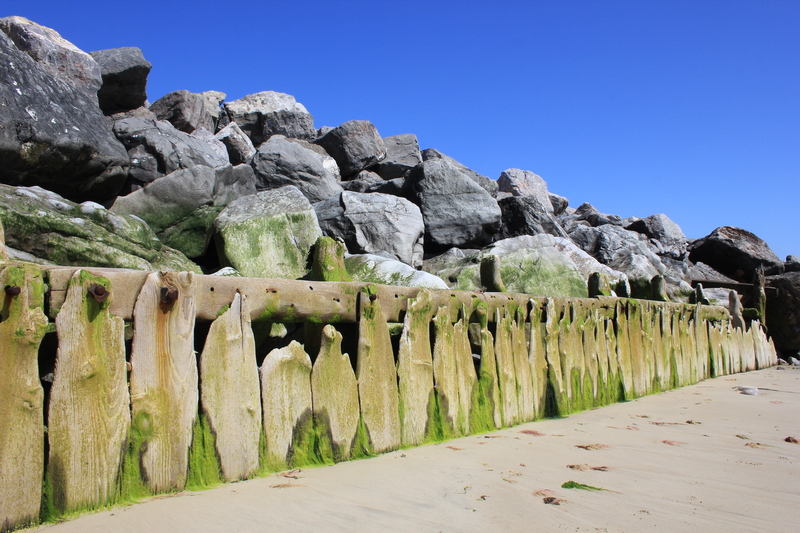 The timber breakwater boards stood battle-weary, waiting patiently to hold back the next tide. The wearing effect of the sea gives wood beautiful, ornate surfaces. 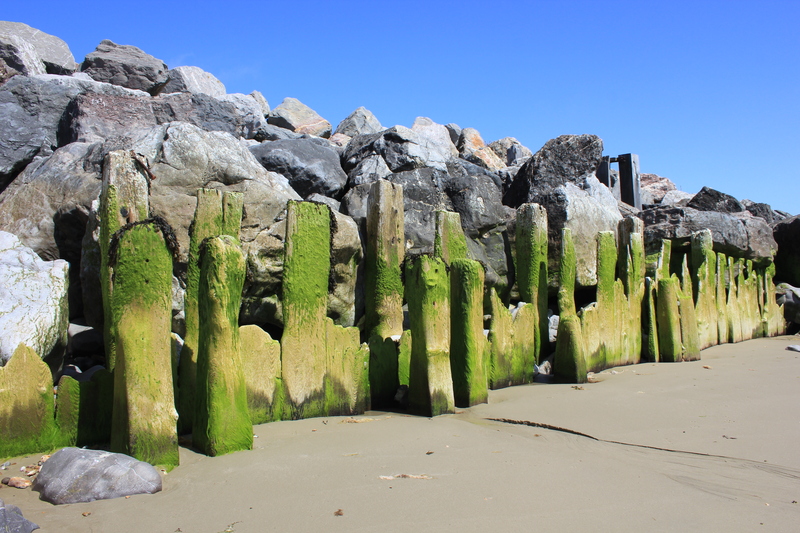 The breakwaters we found on this walk had come from trees long dead, cut by machines and planed into straight edges, fitted square against each other, giving splinters to those foolhardy enough to glide their hand over the surfaces. But once fixed in place the sea gets to work, smoothing the hard edges of each slat into random patterns, like fingerprints, no one the same as the other. The splinters are soothed until the surface of the wood, bleached by the sun, is as smooth as the original living wood of the tree. It regains its character, perhaps even its soul. As if to recognise this, the sea provides clothing as the algae takes root and grows on its surface. 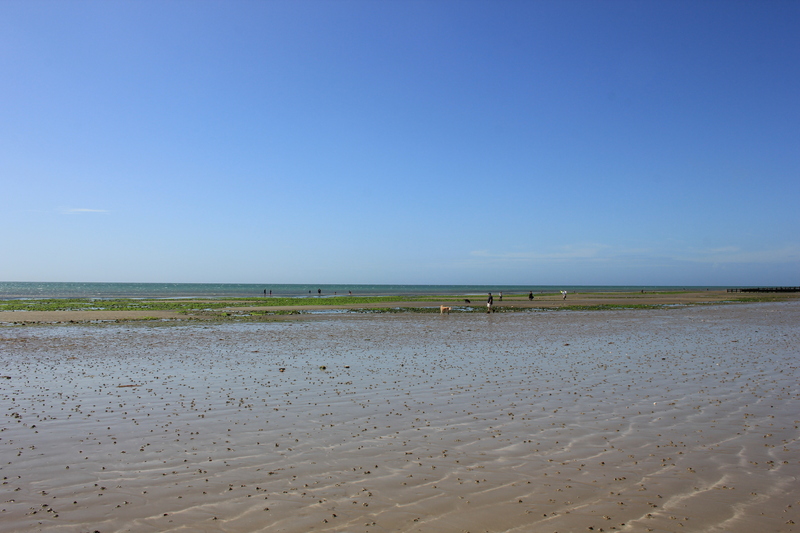 This entry was posted in West Sussex and tagged coast, elmer, green, littlehampton, nature, travel, walking, west sussex. Bookmark the permalink. Fantastic photographs today. The concrete wall with holes was interesting. I wonder if it is a kind of sea defence wall. 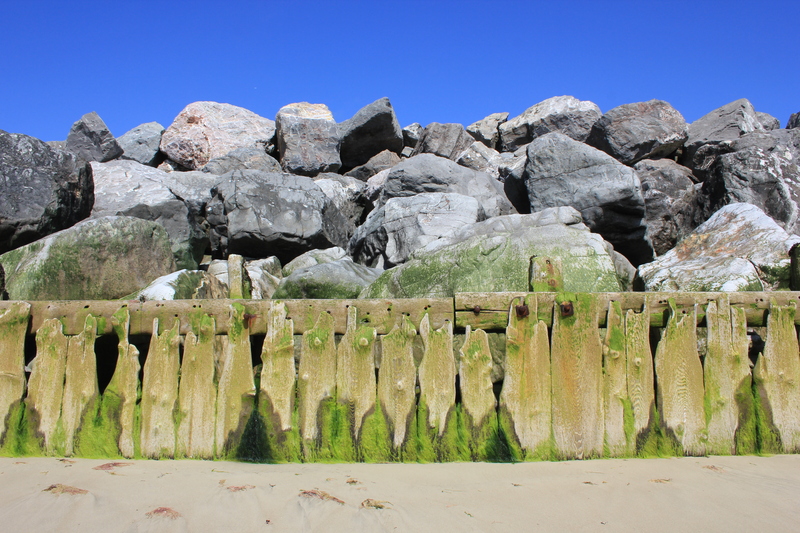 I know that one of the concepts of using rip-rap boulders at the top of a beach as a defence against erosion by the sea, is that the spaces are as important as the solid barriers in dissipating the energy of the waves. Most of all, I like the images of the algae-covered timbers. Great shots. I like the way timber weathers. That green algae is everywhere this year – I suppose it is the unseasonal warm weather we have been having! Location: Atherington: at the E end of Climping Beach, at the end of a long straight anti-tank wall, above the level of the lane behind. Description: 29/07/1999 Curved wall, raised in height by just over a foot. In the portion added are 4 loopholes. The W one is set at an angle to face SW. The wall is about 3ft high and 18ins thick. 1996 Loopholes incorporated in the seawall. There is also the remains of a trench on the N side of Mill Lane. Thanks Ron! Always good to have someone in the know on these things!